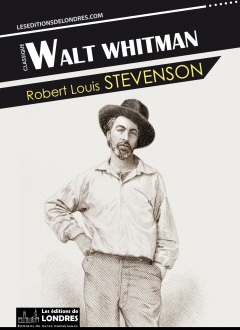 “Walt Whitman” is a short essay from the compilation “Familiar studies of men and books”, written by Robert Louis Stevenson. “Walt Whitman” was first published in New Quarterly Magazine in October 1878. Walt Whitman.—This is a case of a second difficulty which lies continually before the writer of critical studies: that he has to mediate between the author whom he loves and the public who are certainly indifferent and frequently averse. Many articles had been written on this notable man. One after another had leaned, in my eyes, either to praise or blame unduly. In the last case, they helped to blindfold our fastidious public to an inspiring writer; in the other, by an excess of unadulterated praise, they moved the more candid to revolt. I was here on the horns of a dilemma; and between these horns I squeezed myself with perhaps some loss to the substance of the paper. Seeing so much in Whitman that was merely ridiculous, as well as so much more that was unsurpassed in force and fitness,—seeing the true prophet doubled, as I thought, in places with the Bull in a China Shop,—it appeared best to steer a middle course, and to laugh with the scorners when I thought they had any excuse, while I made haste to rejoice with the rejoicers over what is imperishably good, lovely, human, or divine, in his extraordinary poems. That was perhaps the right road; yet I cannot help feeling that in this attempt to trim my sails between an author whom I love and honour and a public too averse to recognise his merit, I have been led into a tone unbecoming from one of my stature to one of Whitman's. But the good and the great man will go on his way not vexed with my little shafts of merriment. He, first of any one, will understand how, in the attempt to explain him credibly to Mrs. Grundy, I have been led into certain airs of the man of the world, which are merely ridiculous in me, and were not intentionally discourteous to himself. But there is a worse side to the question; for in my eagerness to be all things to all men, I am afraid I may have sinned against proportion. It will be enough to say here that Whitman's faults are few and unimportant when they are set beside his surprising merits. I had written another paper full of gratitude for the help that had been given me in my life, full of enthusiasm for the intrinsic merit of the poems, and conceived in the noisiest extreme of youthful eloquence. The present study was a rifacimento. From it, with the design already mentioned, and in a fit of horror at my old excess, the big words and emphatic passages were ruthlessly excised. But this sort of prudence is frequently its own punishment; along with the exaggeration, some of the truth is sacrificed; and the result is cold, constrained, and grudging. In short, I might almost everywhere have spoken more strongly than I did.